My regular followers may think but she has already blogged one thepla recipe. Has she forgotten, has she run out of recipes? Nothing like that my friends. These are normal theplas. The one I had blogged earlier were farari theplas to have on days of fasting or Ekadashi. Wherever there are Gujaratis, theplas are there. Theplas is such a versatile kind of flatbread, paratha, whatever you want to call it. Some are slightly thick, some are thin, some are plain, some have added vegetables. The variation depends family to family. There is no one fixed recipe for theplas. Gujaratis enjoy theplas for breakfast, for lunch or dinner with some curries. My favourite way to enjoy them is dunking in hot masala tea, or with some dahi potato curry. A great picnic dish to carry, enjoy them on its own with some pickle and hot masala tea. Need travel food? Well be assured theplas will come in handy. Just roll it up and enjoy them on their own. I love making theplas because you can use up your leftover rice, pilau, biryani, khichdi, dal, some pieces of leftover cabbage, carrots etc. You can use a mixture of any of the above. For example add plain rice, grated doodhi, methi etc. However, because of the vegetables, rice etc in the thepla, these do not stay good for too long. Maximum 2 days. The leftover theplas can be put away in the fridge. Warm it up under the grill, in the micro or on a tava. Usually whenever I need to make theplas as travel food I like to make them without any added rice, dal or vegetables. I use only fenugreek and coriander. Whatever vegetables, rice or dal you use, make sure you mix everything into the flour. This will give you an indication as to whether you need to add extra water or yogurt. If you can’t add sour yogurt, add some lemon juice. Sieve the flour into a bowl. Add turmeric powder, salt, jeera, tal, ajmo and sugar if you are using any. Mix well. Add oil to the flour and rub it in well. Add the ginger, chilli and garlic paste. Mix well. Add rest of the ingredients except for yogurt and mix well. Add ½ of the yogurt and start forming a dough. It should be of medium consistency, not too soft or not too hard. Add the rest of the yogurt if required. Heat the tava or frying pan over medium heat. With the help of extra flour, roll out one part about 6″ in diameter or so. Put it on the hot tava (it should not be too hot). Reduce the heat to low setting. Let one side cook for 2 to 3 minutes. Flip and cook the other side. Smear a tsp of oil on the top side and flip it. Smear oil on the top side. Cook both sides till you have light brown specks. Put on a wire rack to cool a bit or serve hot with pickles. Repeat from step 7 with the rest of the dough. Use mashed potato instead of rice. If you do not have any leftover rice then increase the grated cabbage or doodhi to 1 cup. Use fresh chopped coriander instead of methi. For more crispy theplas smear a bit more oil on both sides. If your dough becomes too soft, add more flour. Once you make the dough, roll out the theplas immediately because if the dough is left, it will become soft. Have them with hot masala tea, pickles or yogurt. This is one healthy thepa with loads of veggies. It must be a filling meal with some yogurt. Lovely pictures. Thanks Usha, we often have it for dinner with pickle and yogurt. yummy!…….iv never made these before………….but used to love it when my friends used to bring it in their school snack boxes!! :D…………..now mayb I can make it for my kids…………lovely pics mayuri! Thanks Farah, they are easy to make, try the recipe out. Wow, those theplas looks just prefect and my kind of food. I love these sort of flatbreads. My mouth is watering here. Well done Mayuri. 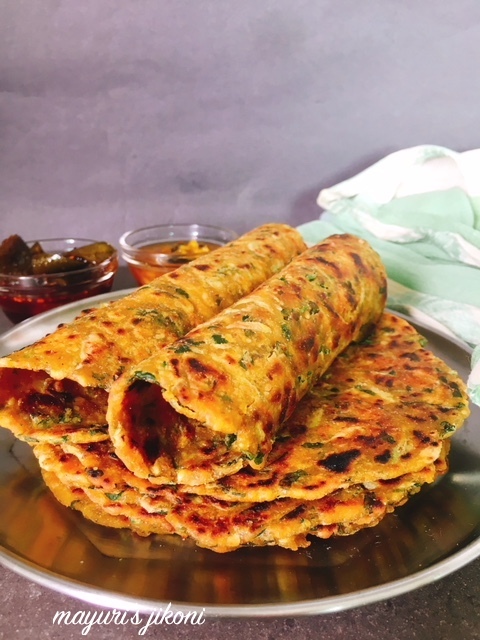 We too make lot of theplas and enjoy them as our travel food , these theplas look so well made , love these methi ones , though the complete list is interesting . We love theplas and you have given so many variations to the standard methi theplas that I make, Your theplas look delicious. Thanks Varada. Every variation tastes different. Feels like there is crunch in every bite of these theplas. So much filled with goodness, some achar and yogurt and dinner is set! Thanks Rafeeda, definitely dinner is set with thepla, yogurt and pickle. Wow the theplas look so so tempting and so perfect…I can eat them any time of the day, in lunch , dinner or with a cup of tea. Thanks Renu.. my favorite too. Oh I love theplas and you have surely got them done so well! It’s in my todo list for very long time, the theplas looks so good, with those veggies, it makes a healthy meal for sure. Thanks Sandhiya. Try them, its pretty easy to make. The theplas look so good Mayuri. I didn’t know about adding leftover rice and dal in theplas. Thanks for all the suggestions. Thanks Gayathri and most welcome. Usually my dals are thick. When you add dal add water accordingly if need be. Those theplas look absolutely delicious. With so many veggies, it looks like a perfect combination of taste and health! Beautifully made theplas Mayuri. It’s true that where ever there are Gujaratis, there are wide variety of theplas. They are just perfect for lunchboxes, picnics, long journeys – just about for every day. Thanks Pavani and you’re right… such a versatile flatbread. Yummy theplas. I love the colour your theplas have. Thanks Archana.. its the haldi. I never knew that cooked rice is also added in the theplas. Nice to know the interesting and tasty recipe. Thanks Sapana, we add so many things to the thepla dough. Just yesterday had a small amount of moong dal left over so added that. This thepla recipe looks so inviting.